Iraq is the birthplace of some of the oldest civilizations such as the Babylonians and the Assyrians. However, tourism has been severely overlooked in the recent past, and some of the ruins have been utterly neglected. Even so, there are plenty of other historical places that you can visit, although most people who go to Iraq do it to visit holy sites. After all, Iraq is an Islamic country. Sightseeing is not a priority, and some regions are dangerous, such as Mosul, but the best part of Kurdistan is safe, and you should have no incidents there. Before you travel to Iraq, you need to see if you need a visa, and chances are that you do. There are no visa exemptions for Iraq, but 8 nationalities can obtain a visa on arrival at Al Najaf International Airport. At the same time, it is a well-known fact that most tourists travel to Iraq to visit Kurdistan, which is why the region is available for some nationalities visa-free. As a result, the nationalities who visit Iraqi Kurdistan can enter the area without a visa and stay there for periods that vary between 15 days and 30 days, depending on the country of origin. The rest of the nationalities need to obtain a visa before they travel to Iraq. If you want to see which visa you need for your trip, you can look at Iraq’s visa policy, although using the Visa Checker would be more convenient. All you must do is access the tool, which is located in the top right corner of this page, choose your country of origin in the left drag-down menu, and put Iraq in the right menu. In an instant, the Visa Checker lets you know if you need a visa or not. Moreover, if you do need a travel document, the tool provides a list of the nearest embassies. iVisa does not process visa applications for Iraq, but we can offer some valuable information so that you are well informed. That is why our support service can answer all your questions. The support service is available to you 24/7, and it is free of charge. Before going to the embassy and apply for your Iraqi visa, you must check out the requirements. You are free to do that online, but we think that the information you find on the internet should be used as a reference only. It would be better for you to call the issuing authority itself and ask your questions there. An embassy is always a more reliable source of information. That way, you cannot make any mistakes. 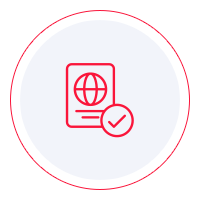 On the other hand, we can tell you that the general requirement asks you to have a valid passport that does not expire for another 6 months from the date of your arrival in Iraq. We regret that we cannot help you with the visa application process, but it is our hope that the information above helps you understand what you must do next. If you have other questions, feel free to contact iVisa.